Here are some facts about the Brandenburg Gate. The Brandenburg Gate is a triumphal arch in Berlin. 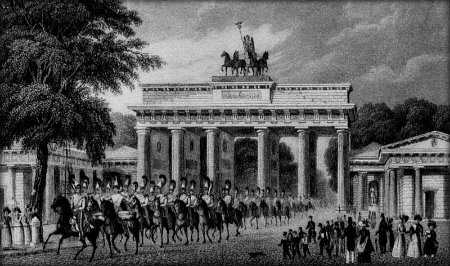 Commissioned by Friedrich Wilhelm II, the Brandenburg Gate was built between 1788 and 1791. It was designed, by Carl Gotthard Langhans, to represent peace. The gate is made up of 12 columns, forming five walkways. A statue of a chariot drawn by four horses (called a quadriga) sits on top of the gate. In 1806, Napoleon had the Quadriga statue removed from the gate. It was kept in Paris until Napoleon was defeated in 1814, when it was returned to Berlin. The goddess Victoria is riding in the chariot. The gates style is based on the Acropolis in Athens, Greece. When the Nazis came to power, the Brandenburg Gate was used as a Nazi symbol. The gate survived World War II, but it was riddled with bullet holes and the Quadriga was almost totally destroyed. After the Berlin Wall fell in 1989, the Brandenburg Gate came to symbolize freedom. In 2000 the gate was repaired and restored. The work cost 6 million Euros. The area around the Brandenburg Gate is now fully pedestrianized.